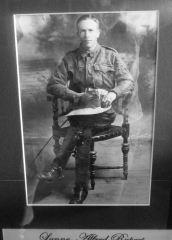 Alfred was a 21 year old Postal Assistant of Gilgandra when he enlisted with the Coo-ees and marched to Sydney. He was born in Dubbo, the 3rd child of Wilhelm and Emily Lingstrom of Warren Rd Gilgandra. He was the brother-in-law of Alex Miller, the Secretary of the Coo-ee March. He was a member of the Geurie Rifle Club. His medical examination in Dubbo on October 26 described him as 5’ 6 1/2” tall, fair complexion, grey eyes, with perfect vision and light brown hair. His religion was Methodist. He joined the march at Blayney, marching to Sydney to train at Liverpool. He embarked on the Star of England on March 8 with the 13th Battalion and trained in Egypt. In May 1916, he transferred to the Signal Section of the Engineers Training Depot and then taken on strength with the ANZAC Mounted Division Signal Squadron and served in Egypt and Palestine. Alfred returned to Australia on the Malta on July 3, 1919 and arrived on August 10, 1919. Alfred was discharged on October 3, 1919. After the war he returned to the postal department and was postmaster in country towns. He died in 1952 aged 55 and is buried at the Woronora Cemetery Sutherland. Alfred was also known as Alf Lynne and Pug Lynne.